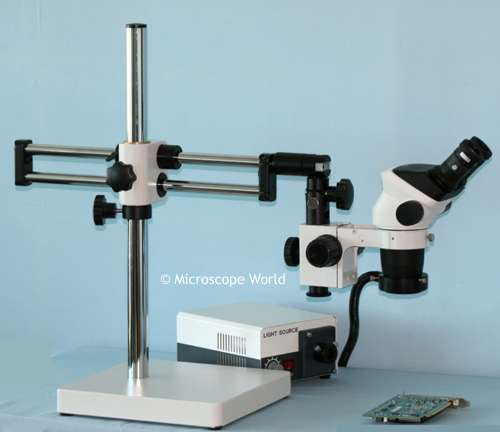 Stereo microscope are often used to inspect large parts. When using a standard stereo microscope, often times the large pieces will not fit under the microscope. This is when a boom stand becomes helpful. Stereo microscope on ball bearing boom stand. There are three types of microscope boom stands. Standard boom stands have a single horizontal and vertical pole. Ball bearing boom stands slide on the horizontal axis, making it easier to move the stereo microscope head back and forth when viewing objects. Articulated arm stands have several joints that can be locked into place. Stereo microscope on articulated arm stand. You can view stereo microscopes on boom stands here. 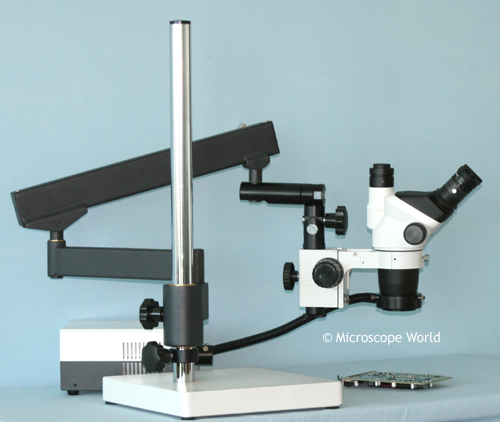 Stereo microscopes on articulated arm stands can be viewed here.